Retreat to your own private lodge! 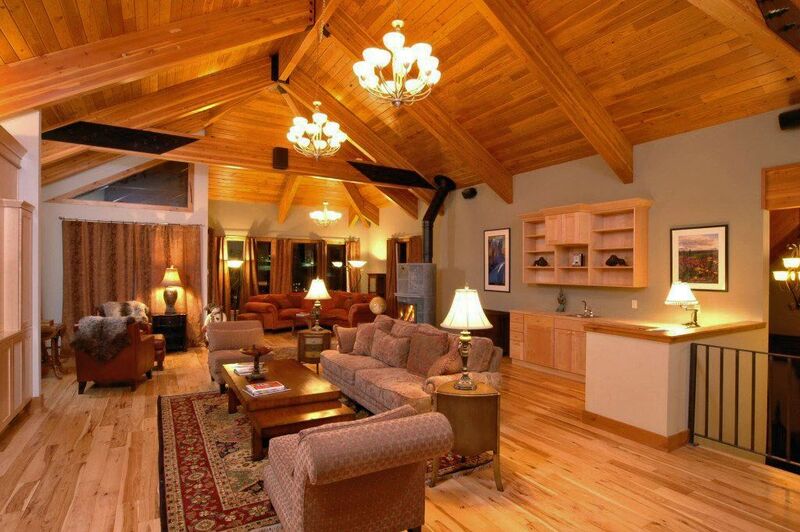 The Crested Butte Retreat is a luxury vacation home located on the mountain in Mt. Crested Butte, CO. The Retreat is perfect for family reunions, small weddings, and corporate getaways. You will feel right at home in this spacious 11,500 square foot Rocky Mountain getaway. With its timber beam interior, wood floors, granite kitchen, private decks, private hot tubs, projection screen TV, fireplaces, and spa room - you are sure to find something for everyone. All of our bedrooms have a private bath, satellite tv, and dvd. Several of the rooms have all of these amenities plus a private hot tub, deck, oversized bath, and gas fireplace/stove. The skiing is a short shuttle ride away in the winter time and summer hiking begins right at the end of our road! A Colorado luxury vacation home: The Crested Butte Retreat invites a relaxing and rejuvenating stay from the moment you walk into the lodge. In the evenings our concierge can arrange for a private chef to prepare dinner for you on site. Sink into one of the couches in our three common area rooms. The grand room boasts an enormous drop down projection screen tv with DVD's, and board games. Set up a full bar in the lounge area and enjoy the gas fireplace while relaxing on the oversized couches. The dining room has seating for 24 people as well as an additional lounge area with wood-burning fireplace. The setting is absolutely spectacular and there are views from every window. Concierge service is available to help you plan a wonderful trip! Daily housekeeping and breakfast is available for an additional price. Retreats and Weddings: The Retreat is available for corporate retreats and small weddings! Although we can only accommodate 26 overnight guests, the Retreat is suitable for gatherings up to 75 people for an additional event fee of $1500. The Crested Butte Retreat is owned by Fred and Tina Studier. Fred is from Long Island, NY and is a graduate of Pomona College and Harvard Business School, was a partner with Bain & Company, management consultants, and is currently President and CEO of Learner's Digest Int'l. Tina is from Minneapolis, MN, and is an interior designer and professional organizer. Her love for design is showcased in this home. Fred and Tina currently live in California with their 3 daughters, but are in Crested Butte often and love to ski, snowboard, hike, mountain bike, and have fun in town. We fell in love this home the moment we stepped inside 7 years ago. It was then being operated as a boutique hotel. After continuing to operate the property as a hotel for several years (and garnering a lot of national publicity), the town shut us down due to zoning regulations. It was a blessing in disguise because now groups of people can enjoy the home without feeling like they are intruding on other people's vacations. Everyone can now experience our amazing home the way that we do, privately! Our home is all about the views! Our favorite spot is in the hot tub on the deck of the Castle room, looking up at The Butte. We also love the interior architecture of the home...hand-forged iron railings, soaring exposed-beam ceilings, hickory floors, and windows, windows, windows! All bedrooms have their own private baths. Castle, Maroon Bells, Treasury, Pearl, and The Butte have double vanities. The half bath for The Butte is located on the lower level of the unit adjacent to the bedroom. The Retreat is located at an altitude of 9500 feet. Crested Butte Mountain Resort is just down the hill from our home and offers many activities in the summer and winter. baseboard heating can be controlled in each individual guest suite. 2 dishwashers in main house kitchen, 1 dishwasher in bar area of living room. Dishwasher in The Butte kitchen. Gourmet kitchen in main and smaller kitchen in The Butte condo suite. Large dining room in main house seats 16 at main table and 8 more at two round tables. Additional dining space in The Butte condo suite. -The Retreat is accessed by 2 flights of outdoor stairs that may pose a challenge to some. -We do not allow smoking except in outdoor areas. -Daily housekeeping can be added for an additional price. -Private chef services can be added for an additional price (daily breakfast is always popular). -Concierge services available for an additional price (grocery delivery, shuttle arrangements, activity scheduling, or anything else you need). -While we do not have an onsite staff, our caretaker lives on the property and will check you in/out and is available for emergencies. Perfect in every way!!! Yes, there are stairs, but no way you can get a house like this with out them. The view is breathtaking from every room and every room is spacious and beautiful. Brian is amazing and although we didn't have any issues he responded immediately to any questions we had during our stay. There were 17 of us from age 2 to 60 and we all were so happy. We cooked most nights in the fully equipped kitchen, but booked a chef recommended by Brian for one night and that was such highlight for us all. The shuttle was reliable and easy to use, but plenty of parking should most guests bring a car like we did. The location is amazing. The space plan is a bit odd, disjointed and illogical. The furnishings are a bit dated and hodgepodge. Random chairs, saggy mattresses, unmatched kitchen utensils... That being said it is a great place for large groups. Gorgeous views, Jacuzzi's galore, plenty of large spaces to gather. I say charge more money and make some improvements. This could be a spectacular property with some updating. Great house for a large group. As other reviews show, there are a lot of steps but you have a house built in the mountain so expected. For teens and adults, perfect location. Walkable to slopes, most of our group was able to ski back and walk down back to the house. The others took the free bus from the square, it runs on the hour so nice alternative. The caretaker was very attentive, only needed to contact him a few times but he was responsive. Beautiful property that easily accommodated 25 people! My family rented this beautiful lodge for the first week of the new year. There were 25 of us and we never felt crowded. There are multiple living areas where we could watch tv, play games or just enjoy each others company. The suites were huge and gorgeous! Each one of them had a fireplace or gas stove and hot tub. Most of the time we gathered around the kitchen when preparing meals as there is a huge table and living area with two additional table right off the kitchen. The breathtaking views from the lodge's main living room (all glass) faced the mountain and we could watch the skiers coming down or the snow clouds moving in. The kids actually went sledding outside the lodge down a large hill. The lodge is beautifully maintained and the caretaker lives on the property and is quick to response with any questions we had. There was also plenty of parking for our large family. And... multiple washers/dryers which we made good use of. We were on Mount Crested Butte so getting to the slopes was only a few minutes away! My family is already asking if we can go back next year!!! This is a wonderful property that can hold lots of adults and children ( including babies ). We had a family reunion there this summer and it was wonderful. 4th of July parade in Crested Butte is a must. Lots of hiking and fun. The property was one of the most impressive places I’ve ever stayed. For a large group looking for a comfortable and welcoming place to gather that is only a short walk from the ski resort, there is not a better option in Crested Butte. Crested Butte is an outdoor enthusiasts heaven as well as a relaxing escape for those wishing to get away from it all. Outdoor activities include: hiking, kayaking, fishing, fly fishing, wildflower viewing, wildlife viewing, 4x4 trails, mountain biking, horseback riding, skiing/snowboarding, back country skiing/snowboarding, snowmobile tours, ATV tours, whitewater rafting, Frisbee golf, outdoor summer concerts, and much more. During ski season the free town shuttle will stop directly in front of the property every thirty minutes and will take you to the ski resort base area. Those who are somewhat adventurous may find ways to ski out down to the base area. In the summer the free shuttle is a short hike away down to the base area. This shuttle connects you to downtown Crested Butte without driving. Golf: Golf Crested Butte at the Crested Butte Country Club. Mt. Crested Butte looms in the background with each shot. Guests may also enjoy Dos Rios Golf Club in Gunnison. Dos Rios features 18 holes with a meandering river and a nice relaxed atmosphere. Dos Rios generally is open earlier and longer than Crested Butte Country Club due to snow conditions. Ski: Ski Crested Butte right from the convenience of your vacation rental. The retreat is situated about 400 yards from the ski resort at Mt. Crested Butte. Some guests with intermediate skiing skills may find that they can ski directly down to the base area for a short hike to the lifts. Other guests will enjoy the free town shuttle that will pick you up in front of the retreat every 30 mintues in the winter. Our concierge can arrange for your lift tickets to be waiting for you upon arrival and can schedule VIP equipment so you and your party can be fitted for equipment in the comfort of the home...no waiting in lines at the base area! You can also arrange for your equipment to be delivered to the Retreat and our caretaker will have it all waiting for you in our ski storage area. Rental agreement must be signed and returned within 10 days. Rental agreement is non-negotiable. Cancellation Policy: more than 90 days before arrival = $2000 cancellation fee. Less than 90 days = loss of deposit. Event fee of $1500 will be charged if you will be hosting add'l guests (more than 26) at the house for a reunion, wedding, retreat, etc. and you will need to show proof of insurance. Guest responsible for renting the house (signing the rental agreement and making the payment) must be at least 25 years of age and must remain on the property for the entire stay. Violation of this will result in loss of the damage deposit and could result in legal action if there is property or bodily damage.